Insulating firebrick is used to line fireplaces, fireboxes, furnaces and kilns built in homes, businesses and manufacturing facilities. It is sometimes referred to as “refractory brick” and is designed to withstand temperatures of up to 3,200⁰F while actually conducting very little of that heat in order to provide a greater level of energy efficiency. Insulating firebrick is most often in commercial settings, particularly in manufacturing facilities where there are thermal, chemical or mechanical stresses. Some of these settings include wood-fired kilns and furnaces where abrasion, the buildup of ash, or the constant exposure to high temperatures may otherwise cause the structure to weaken. In certain other settings, such as in a kiln that is powered by electricity or natural gas, immensely porous options known as “kiln bricks” are often chosen instead. Many different types of materials can be used in the manufacture of insulating firebrick but they are generally made from a refractory clay or some other type of raw ceramic material. The pore structure within the brick is controlled very carefully so that more air pockets can form during firing; these air pockets absorb and disperse the heat in the applications in which the brick is used, so these are very important. The bricks will not flake when the temperature changes rapidly and they will continue to maintain their strength and structure for years despite high temperatures. The way in which insulating firebrick is made depends greatly upon the materials being used, in most cases it starts out with a material known as fireclay. It is fired inside of a kiln until it is partially turned into glass and may sometimes be glazed depending upon how it is intended to be used. They come in standard sizes for the most part, but they also come in a “split” form which is half of the standard thickness and is used to line the inserts in fireplaces and woodstoves. Insulating firebrick that is used in high-temperature settings, such as in a steel-making furnace, is generally made from silica, which can withstand temperatures as high as 3000⁰F. Part of it liquefies at this temperature, but this is expected and in fact lends to the insulating properties. Basic refractory bricks are used in other settings, particularly in wood-burning or coal-burning facilities to prevent the transfer of heat to other materials. 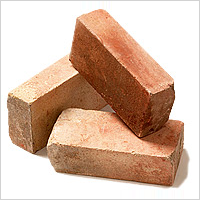 For smaller chimneys and wood-fired ovens, red clay bricks may be used as insulating firebrick. For larger ones, bricks formed from magnesium oxide are common in furnaces while silica is used for the inner lining of incinerators. Since the inner lining actually melts away over time, the manufacturer will often make the brick with a higher amount of alumina in order to lengthen the time between the re-linings which can cause downtime for some industries. Silicon carbide is another popular material since it is highly abrasive and is commonly used in hearths. These days, there are several standard sizes of bricks available and these fit many applications. However, because architecture and technology sometimes call for structures that are anything but standard, it is possible to have the bricks created in special shapes that are machined or cemented. It is best to have an end product that has the fewest joints possible in order to extend the longevity of the installation as well. They can be created with tapers, tongue and groove notches, drilled holes and much more according to plans. When installing the bricks, it is important to find a specially made mortar that can retain water while being strong enough to withstand high temperatures. Any joints that are between the bricks need to be sealed properly in order to extend the life of the entire application. Firebrick mortar comes in several different types, and the one that is used in any application depends upon the chosen brick and the temperature that it will need to withstand. Traditional mortar cannot be used for laying this type of brick; in most cases, the mortar is complementary with the purchase of the brick. Insulating firebrick is used all over the world to protect structures from heat and prevent fires in chimneys, kilns and furnaces. It is constructed from a wide range of materials to suit any application necessary, whether a small wood stove or a large chimney in a coal-burning electric plant. Technologies continue to improve allowing for the manufacture of better, more insulating products.